The new JFX500-2131 from Mimaki smashes all established records for a grand format flatbed UV LED printer, with production speeds of up to 60sqm/h, delivering unbelievably high quality, right down to 2 point text on a massive 2100 x 3100 mm print area. Intelligent Microstepping System (IMS) for accurate prints, even 2pt characters can be legibly printed ! 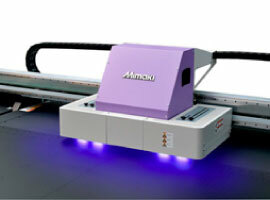 The Mimaki LUS-150 ink is a newly formulated CMYK LED curing ink with high speed curing properties and is flexible up to 150%. This results in increased elasticity on a wide variety of media and substrates without cracking or fracturing the cured ink during handling, cutting or other post-print processing. 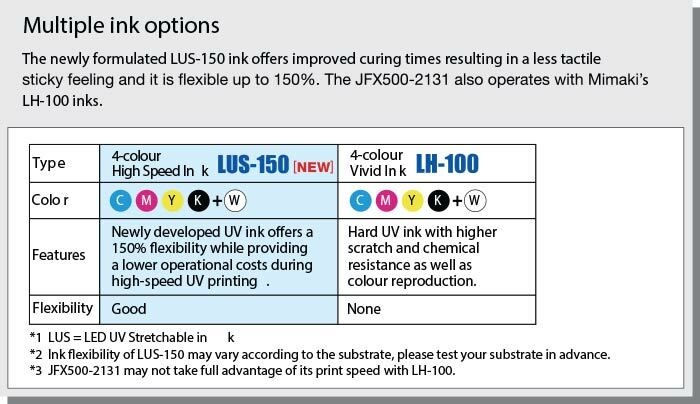 The JFX500-2131 also operates with Mimaki’s existing LH-100 CMYK inks. The printer can also utilise Mimaki’s LF-140 flexible ink which is available in six colours. All these ink formulations also offer white ink. 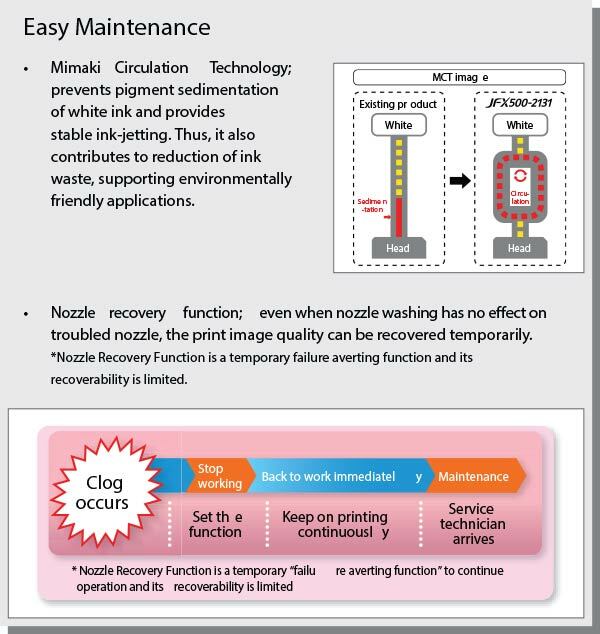 Use of the Mimaki Circulation Technology (MCT) ensures ultra-high performance in white ink printing and this feature regularly circulates white ink, enabling stable output by eliminating settling of white pigment in the ink lines. Additionally, MCT contributes to reduction of ink waste, thereby supporting environmentally and economically friendly applications. Mimaki’s Degassing Module (MDM) also eliminates gas or bubbles inside the ink, reducing nozzle blockage and improving accuracy of ink dot placement. This enables the printer to use Mimaki’s bottled inks instead of conventional degassed ink packs, further reducing ink costs. Equipped with Mimaki’s new print engine (6 print heads in a 3 staggered configuration), the JFX500-2131 achieves print speeds of up to 60 m2/h with CMYK, and 45 m2/h for white ink printing. The printer includes two units of Mimaki's highly-accurate linear scales controlled by an Intelligent Microstepping System (IMS) for fine step accuracy and dot placement. This results in far less banding and the ability to print legible 2 point characters on most media. 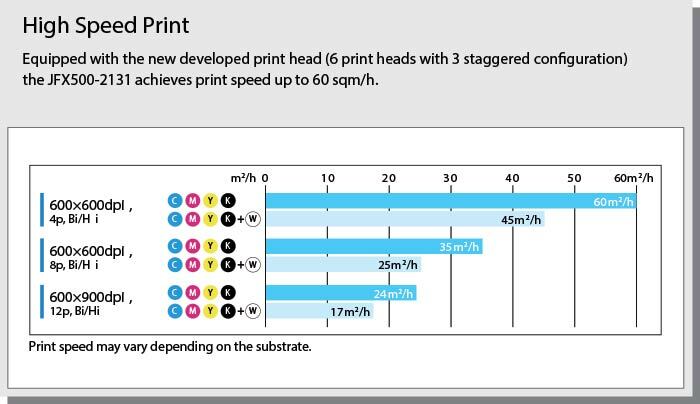 Variable drop functionality simultaneously produces three different drop sizes – the minimum drop size is just 4 pico-litres which results in a smooth, natural gradation and Mimaki’s proprietary head control technology delivers unrivalled high definition and high resolution prints. 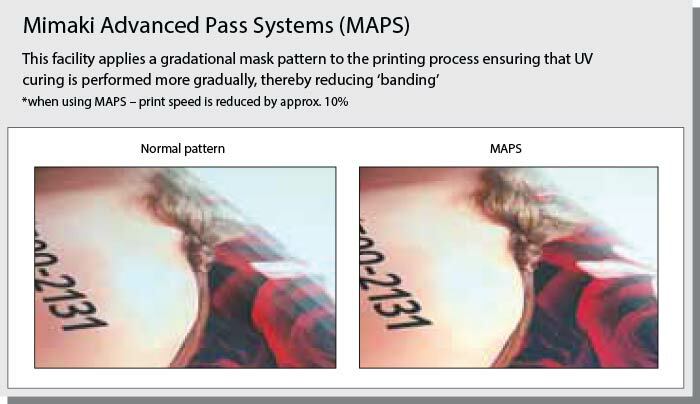 The Mimaki Advanced Pass System (MAPS) further ensures a high print quality with multiple printing passes, using a gradational mask pattern. When this option is selected, UV curing is performed more gradually which diminishes any appearance of banding. 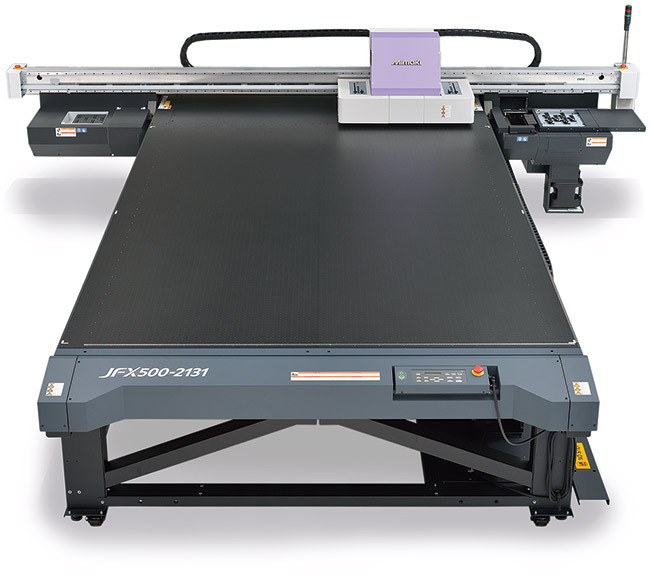 The JFX500 is a true flatbed UV printer. The bed is equipped with a series of locating pins that allow you to quickly and easily align the media on the print with the utmost accuracy. Mimaki’s RasterLink6 RIP software is packaged with the printer and features intuitive operation and powerful pre print tools. Conditions can easily be set with related settings consolidated into a single window and the RIP’s colour replacement function enhances the ability to re-create printed images. Selected colours from the RasterLink 6 colour charts can easily be added into Adobe Illustrator swatches and users can simulate printing colours in Illustrator or Photoshop prior to actually printing, saving both time and money in the design and production process. The RasterLink 6 RIP also simplifies reverse printing – a key requirement for flatbed UV output. 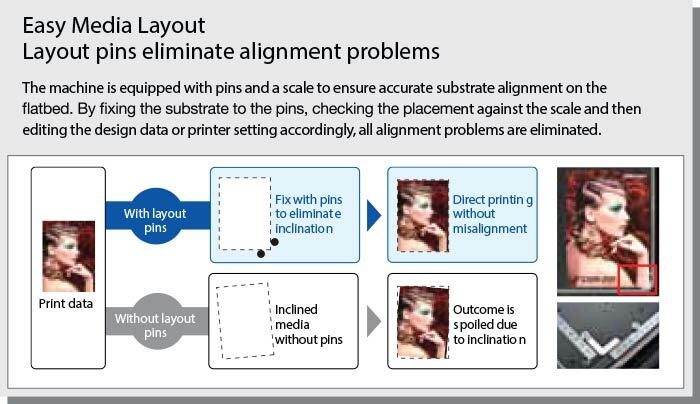 By simply selecting the order of over- and under-print with white in the software, the most efficient path is automatically determined without further operator intervention. The RIP also enables simultaneous printing of three layers; made up of colour, white and colour – which is ideal for two way view signage. Manufacturers Specifcations for the JFX500 2131.